Dégustation de quelques oeuvres extraites du répertoire profane pour chœur de Rheinberger, dans des formations variées, en partie avec accompagnement au piano. "Die Nacht", sur un texte de Eichendorff, se distingue par son accompagnement par un quatuor à cordes. Une majorité d'oeuvres sont enregistrées pour la première fois. Carus Verlag, Stuttgart, the publisher of the new complete edition of Rheinberger's works, has also brought out eight CDs of his music, primarily choral music. Each of these is of highest quality, not only in the excellence of its performers but in every aspect of its production--all of which applies in special measure to this newest release. First and foremost to be noted is the remarkable artistry of the Rastatt Ensemble (once the workplace of JKF Fischer) and its young director, Holger Speck. The sound of this 27-voice mixed choir is akin to pure gold. It is not like the American choral timbre or the English boy choir sound. The Rastatt choral sonority has a translucent purity and clarity, impeccable intonation, perfect ensemble, a wide spectrum of lovely colors, and ravishing dynamic plasticity and control. The perfection of the high notes in the soprano, whether loud or muted, is astonishing. Only a very few times in my life have I heard such glorious choral work. 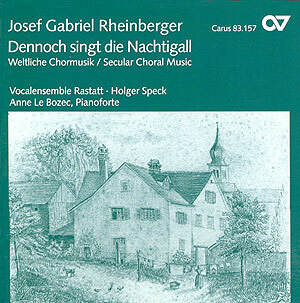 This selection of 23 of Rheinberger’s secular choral songs is a cross-section of pieces for various vocal ensembles--SATB, SSA, TTBB, etc--affording us the opportunity to hear each section of the choral group--and includes many types of pieces in diverse moods. Some are bright folksong-like partsongs; others are deeply sensual or thoughtful. A few are supplied with piano accompaniment, beautifully performed by Mile LeBozec, and the last has a string ensemble with piano. The superb notes inform us that secular choral music constituted a quarter of Rheinberger's oeuvre! In style , these works belong to the body of romantic lieder by Schubert, Schumann, and Brahms. They are richly melodious, with independence of all vocal parts, set in tapestries of luminous harmony, and show an especially sensitive treatment of the German words. This last may be difficult to appreciate fully, since there is no translation, but Rheinberger's sure hand at text setting is nothing short of cloquent. Hearing the music and following the romantic, image-saturated poetry reminded me of how intensively 19th Century artists lived, immersed in the inner world of the imagination, and of how affected they were by feelings; also of how estranged from this ephemeral world we have become in our deteminedly technocratic times. This recording was made in the studio-auditorium of the Southwest Radio, Karlsruhe. Nevertheless, the sound is enhanced by surprising resonance and is warm and natural. This is an exceptional recording, not to be overlooked.